The Loreo 3D Lens in a Cap (patent pending) is a new gadget for SLR cameras with interchangeable lenses. It is the latest in Loreo's digital ready Lens in a Cap series. The 3D body cap turns a standard or digital SLR into a 3D camera. SLR cameras have accurate viewing, exposure control and a wide range of shutter speeds. Some SLRs have auto TTL flash. Most can be fitted with powerful external flash units. With the Loreo 3D Lens in a Cap, these features are harnessed to produce excellent 3D prints or digital images. The processed 3D prints are ready for viewing with LOREO Deluxe or Lite 3D viewers. They can also be viewed on computer screens with a Loreo Pixi 3D Viewer. Viewing in Anaglyph format is not recommended. For the technically minded the 3D Cap has a matched pair of focusing lenses, focusing range from one meter to infinity. F/11 lenses, focal length 38 mm. The 3D Lens in Cap is a brand new design. It forms a 3D effect by transposing two images. Beam splitters designed in the 1960s for SLR cameras have a pronounced keystone effect. The 3D Lens in a Cap retains a slight keystone effect, almost imperceptible without the use of a grid. This was introduced under controlled conditions as a compromise to give the viewfinder a brighter image and to allow the TTL exposure system to function. It is a self-contained, integrated lens and reflector system that mounts directly onto the camera body and does not need any supporting lens. This means that it does not work with SLRs which do not have interchangeable lenses, such as the Olympus E10 and E20 digital cameras. It ships with a choice from 7 common mount types - Canon EOS, FD, Nikon, Olympus, Pentax K, Minolta MD and AF. It is not available with M42 because there is no way of ensuring alignment with a screw mount, which is essential for taking good 3D pictures. Note: The LOREO 3D Lens in a Cap (T) for use with APS and digital SLR cameras is slightly different from the one for standard SLRs because most popular digital SLRs have subframe (smaller than 24x36mm) sensors. Subframe digital SLR cameras typically have a focal length multiplier of 1.5 - 1.6. The (T) version 3D Lens in a Cap is constructed to compensate for the subframe cropping. Examples of subframe digital cameras include the Canon D30, D60, 10D, 20D, Rebel 300D, 350D, Nikon D1, D1X, D2X, D1H, D2H, D100, D70, D50, Pentax *ist D, Pentax *ist Ds, Fuji Finepix S1 Pro, S2 Pro, Minolta Maxxum 7D. The 3D Lens in a Cap (T) is known to work with these cameras. The Canon 1D has a 27.0 x 17.8mm frame size. The 3D Lens in a Cap (T) is not recommended for use with this frame size. 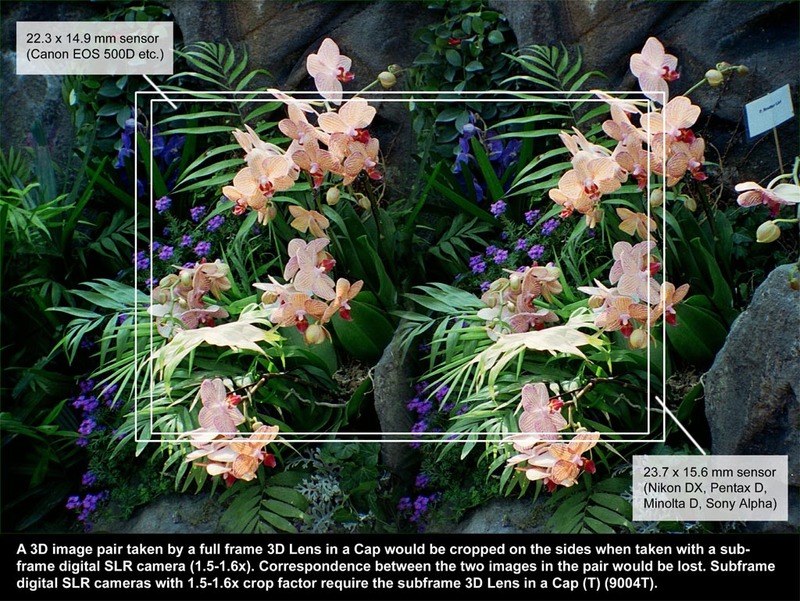 The Olympus E series of digital SLRs (E1, E300 etc) have an FOV multiplier of 2, which the 3D Lens in a Cap is not currently compatible with. The new Olympux mount type is also not compatible with the old one. The Minolta Maxxum (Dynax) line of digital SLR cameras (5D and 7D), are known to work with the 3D Lens in a Cap (T) after the shutter lock has been disabled. The Sony Alpha line of subframe digital SLR cameras - A100, A200, A300, A350, A700 can be used with the 3D Lens in a Cap (T). The A100 and A700 must have the shutter lock disabled first. The A200, A300 and A350 can only be used with non-Sony/Minolta brand lenses in manual mode. Users of the full frame digital cameras released by Canon (5D, 1Ds), Nikon (D3, D900), Sony (Alpha 900), Kodak etc. should use the full frame 3D Lens in a Cap. Loreo Lite 3D Viewer - Black & White - NEW! 3D Snapshots with a Canon D30 Digital SLR - NEW! Gallery of Sample Photographs with 3D Lens in a Cap from third production batch - NEW! At Tuen Mun Park with Vivien - NEW!